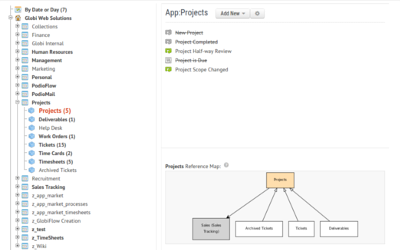 Design your workflows based on your specific business processes. Each workflow has a Trigger, Filter, and Action. 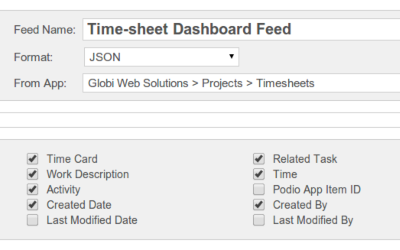 You can trigger workflows when items are created or updated in Podio, and filter on field values and other conditions. Each workflow can perform a variety of actions, including creating new items, updating items, assigning tasks, sending emails, etc. Not only can you design workflows based on activity within your Podio apps, but also on item date fields, like due dates, follow-up dates, etc. Date-based workflows are triggered every day and only act on those items who's date fields match your predefined conditions. You can generate PDF documents on the fly using your Podio data and attach them to the current Podio Item. These PDF's can also then be attached to emails in email actions to send to your customers. Useful to generate Invoices, Purchase Orders, Contracts, and anything else you can think of. 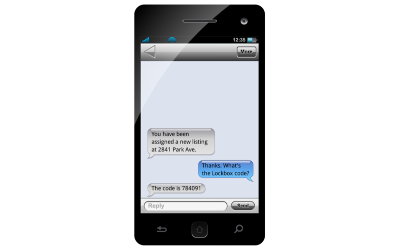 As an action from any Flow, you can send rich text emails to external contacts. You can use the email editor to create beautiful emails that contain any data you would like to include from your Podio items. Not only can you send emails, but replies to these emails can trigger additional flows to file and/or act on those replies. Save any generated PDF to your ShareFile account, or send it to a contact via your RightSignature account for a legally binding e-signature. 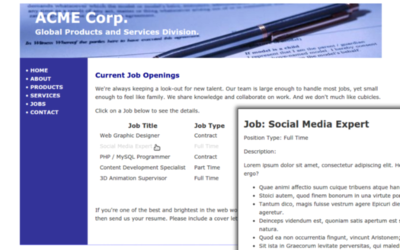 Embed any Podio Item or App Table View directly on your website. For Views, you can also allow visitors to click through to the detail view of each item. By simply pasting a small script tag into your website source, you can expose parts of any app, and effectively use Podio as a simple Website Content Management System (CMS). 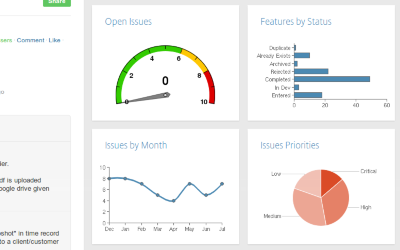 Add some eye candy to your Podio workspaces by converting any report widget into a chart or graph, including bar charts, line graphs, pie charts, gauges, etc. These charts can be inserted into any workspace or app image widget, or into any app item's image field, making it easy to create dashboard apps right inside Podio. You can easily insert intelligent buttons and links into emails that, when clicked, will execute a flow and show the contact a message. These message pages can be daisy-chained to allow external contacts to make multiple selections, each one triggering it's own set of actions. Need to get your data out of Podio? You can easily turn any app into a data feed in JSON or XLM for use in third-party integrations. Feeds can contain any of the fields of your app with specific filtering conditions, allowing you to control what data the third-party apps have access to. 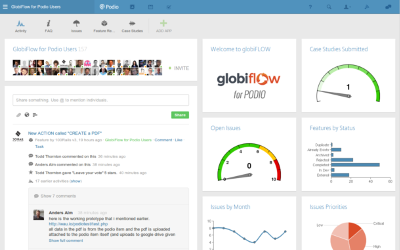 Join our workspace on Podio and be part of a community of GlobiFlow users who are all pushing business process automation to the limit. Since the possibilities are nearly endless, it can be helpful to see how others are automating their businesses in Podio, and to compare notes with them. 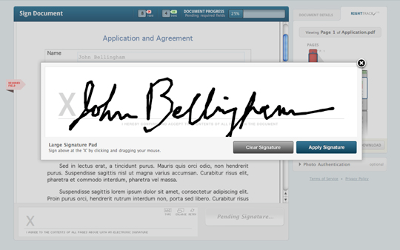 Superb addition to Podio - Must have productivity tools! 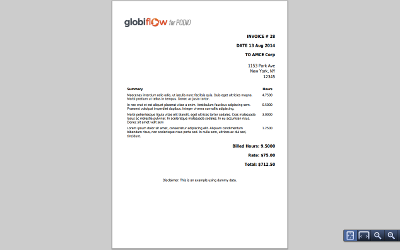 Our productivity really took off when we integrated Globiflow into our system. 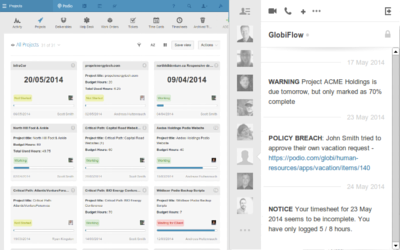 Globiflow lets us take the inherent collaboration power of Podio and supercharge it. GlobiFlow is an absolutely indispensable tool that will make your Podio jump through any hoop you want to make it jump through. 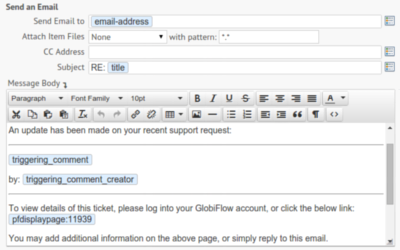 Podio's workflows are a joke compared to what GlobiFlow is capable of.